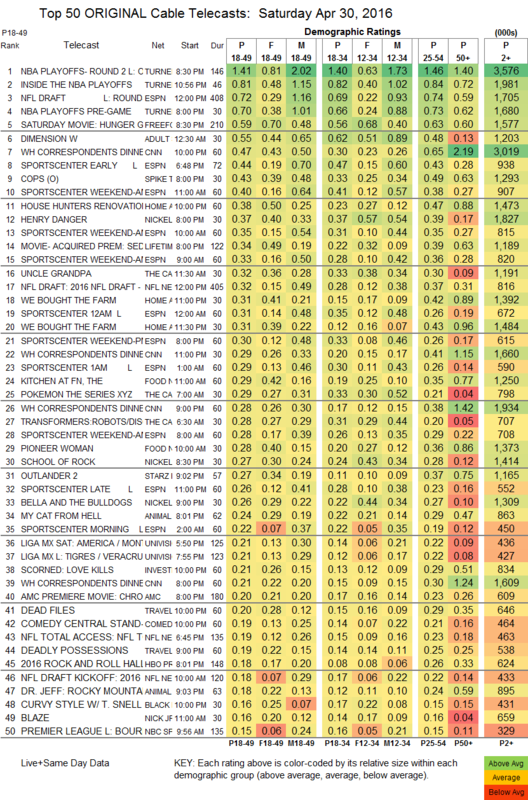 NETWORK FINALS: FOX’s PREMIER BOXING lost 0.1 in final numbers, as did the NCIS rerun at 8PM. CABLE HIGHLIGHTS: Sports continued to ride high on cable, with TNT’s NBA PLAYOFFS game on top at 1.41, and ESPN’s afternoon coverage of the NFL DRAFT at 0.72. The late-night Adult Swim line-up fared as follows: DRAGON BALL Z up 0.02 to 0.64/1.416M, DIMENSION W also up 0.02 to 0.55, HUNTER X HUNTER up a tick to 0.47/1.056M, SAMURAI CHAMPLOO up 0.03 to 0.44/1.005M, NARUTO up 0.03 to 0.42/954K, ONE PIECE steady at 0.35/779K, and PARASYTE up 0.01 to 0.32/678K. CNN’s coverage of the “nerd prom” AKA the WHITE HOUSE CORESPONDENTS DINNER hit the Top 10 at 0.47. Spike’s COPS finale jumped 0.14 to 0.43. HGTV’s HOUSE HUNTERS RENOVATION climbed 0.08 to 0.38, and WE BOUGHT THE FARM ticked up to 0.31 in each of two half-hours. Food Network’s KITCHEN AT FN rose a hundredth to 0.29, and PIONEER WOMAN was up 0.06 to 0.28. OUTLANDER lost a hundredth to 0.27. Comedy Central’s STAND-UP SPECIAL was at 0.19. HBO’s ROCK & ROLL HALL OF FAME INDUCTION CEREMONY was at 0.18.